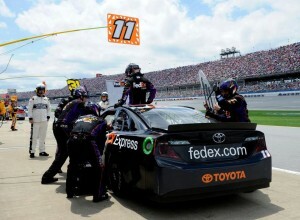 Denny Hamlin returned to the #11 FedEx Express Toyota on Sunday at Talladega Superspeedway after missing the last four NASCAR Sprint Cup Series races with a back injury. He started the race and was replaced by Brian Vickers, who was collected in an early incident and finished 34th. Hamlin was seventh on the starting grid based on practice speeds, as qualifying Saturday was cancelled by rain, but dropped to the back for the green flag knowing the team’s plan was to switch drivers at the first caution to allow Hamlin another week to heal. Driving single-file behind the lead pack to avoid trouble early on, Hamlin and the FedEx team waited for the first yellow flag. The first caution came out on Lap 22, and the team executed a flawless driver change, with Hamlin climbing out for Vickers. The team did not lose a lap under the caution, and Vickers restarted at the tail end of the field. He started moving forward in the draft to gain track position for later in the race, but less than 20 laps after climbing in the car, unfortunately, Vickers was collected in a multi-car incident in Turn 2 triggered at the front of the field, and he sustained heavy front and side damage that required extensive time in the garage for repairs. After returning to the track and waiting through a three-hour rain delay, Vickers took the checkered flag in 34th position behind race winner David Ragan. Hamlin hopes to run the full race at Darlington Raceway on Saturday, May 11, as he hopes to climb back up in the points in his quest to qualify for his eighth-consecutive Chase for the Sprint Cup championship.